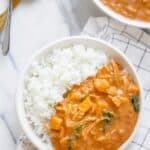 This authentic West African peanut soup recipe is made with simple ingredients like peanut butter and tomato paste, but the flavor is unique and delicious! Did you guys know I grew up in West Africa? And that’s why I’m sharing with you today my favorite meal I ate in Sierra Leone for the 11 years I lived there – it’s peanut soup! There are many variations of this recipe depending on the origin. My version is the authentic recipe that I learned from my mom and grandma, who each learned it from the locals. This is a staple recipe in Africa. 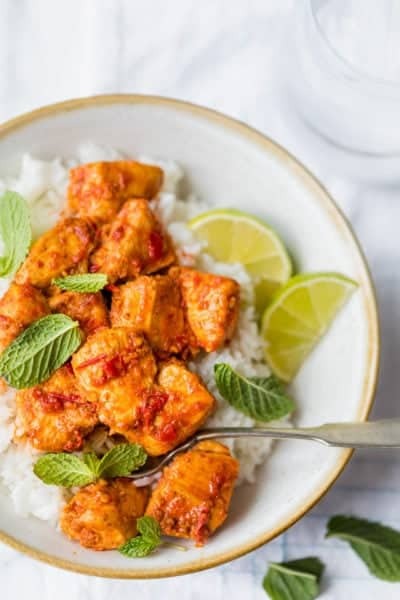 But the ingredients are pretty basic so you can easily recreate this recipe with items you probably already have in your pantry! Peanut soup is an authentic African recipe that’s very popular in West Africa, and especially in Ghana. I grew up in Sierra Leone, so the version we used to eat may slightly vary from other regional versions. But essentially, the recipe is made up of ground peanuts (or peanut butter) with tomato paste and spices. The authentic name for peanut soup is granat soup. Granat is the krio term for groundnut – aka peanuts. While it’s common practice to grind the nuts for making the recipe, any peanut butter you buy works well here. 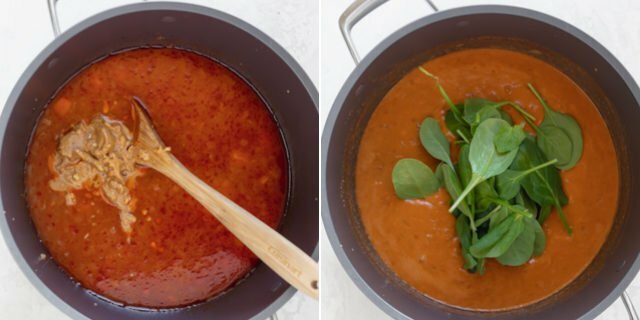 If the idea of peanut butter and tomato paste turned into soup makes you question this recipe, I strongly urge you to get past that apprehension! There’s a cup of peanut butter in the recipe, so it will taste like spicy watery peanut butter. Served over warm rice, it’s a creamy, spicy and comforting combination. 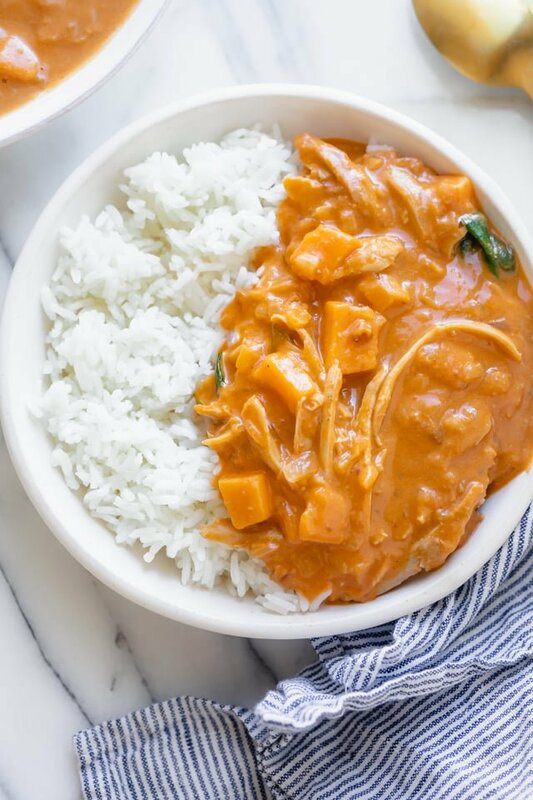 It reminds me of Thai peanut sauce and has all the feels of a curry. My recipe makes a huge pot of granat soup, which is 6 large portions. Without the rice, it’s only about 300 calories per portion. However there is about 26 grams of fat per serving because of the peanut butter. You might know that peanuts have good fats. But they’re also an excellent source of protein and healthy nutrients. The traditional recipe does use red palm oil. And while there are mixed indications about the health benefits of palm oil, I don’t cook with it personally. Healthy means a different thing to everyone depending on your body and nutritional needs. But to me, this is a nutritious dish that’s made with good fats, protein and vegetables. So it is healthy by my book! To start, cook the onions with fresh ginger (if you’d like) until they’re soft and aromatic. Next add the tomato paste. I use 3 ounces (which is half a can of tomato paste). You can use a little more or less. Next, mix everything well together and add the sweet potatoes, along with vegetable broth or water and cook for 20 minutes on low. 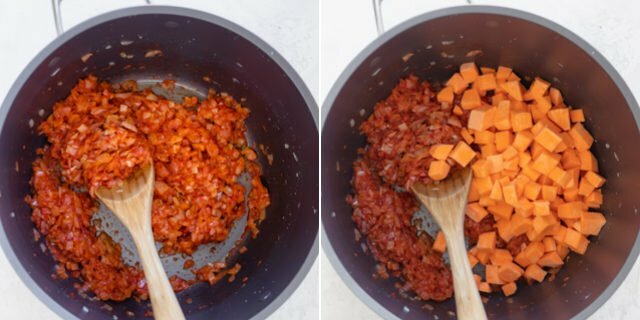 You want the sweet potatoes to soften but not turn mushy. If you’re adding cayenne pepper or chile peppers, this is the time to do it so they can incorporate into the broth. And, if you’re adding chicken to the dish, you can boil chicken in another pot and use that chicken broth for the dish. You can also use a bouillon cube along with hot water. 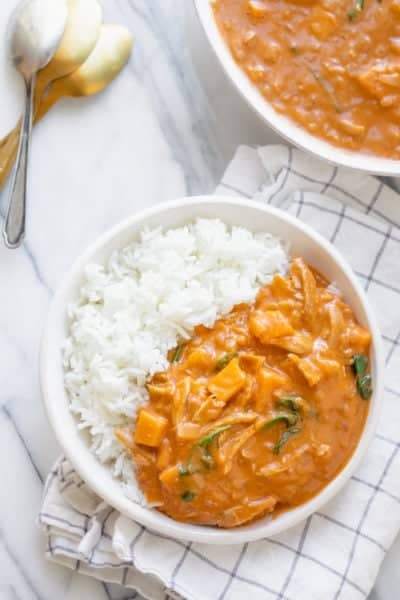 Now that the sweet potatoes are tender, add the peanut butter and stir everything together until the peanut butter blends into the soup. You’re pretty much done with the recipe now. But you can add some greens to bulk it up. I love using baby spinach since it’s mild and softens quickly. You can also add some shredded chicken. If you’re keeping it vegan, feel free to add tofu or skip this part all together. It’s not mandatory to have chicken included in the dish. But it was very common for us to have it this way growing up. While it’s called a soup, we actually grew up eating this soup over rice. So it’s actually more like a curry than a soup. In Ghana, they eat it with fufu, which is dough made from boiled cassava. But we grew up eating it with white rice. I like to make either Jasmine rice or basmati rice and I’ll make about 2 – 2 1/2 cups to go along with this recipe. If you want, you can also serve this with brown rice or quinoa. And if you’re looking to keep it low carb, you can actually just enjoy this as a peanut butter soup on its own. And I love adding some crushed roasted peanuts on top. It adds a crunchy and salty topping that pairs really well with the creamy hearty bowl of peanut soup. 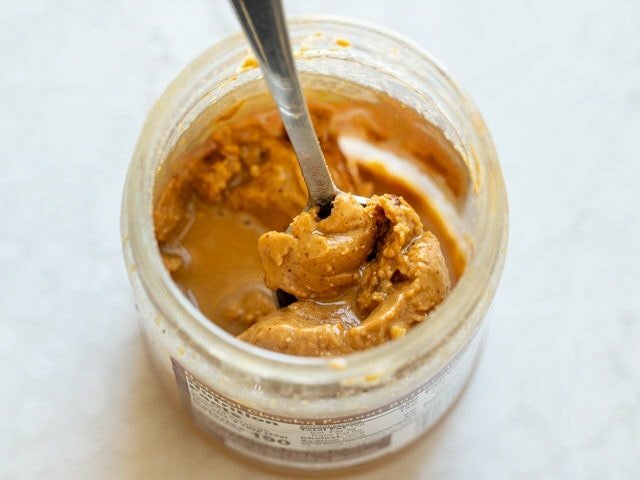 Use natural peanut butter made with only peanuts and salt. Whether you opt for chunky or creamy, that will really come down to your preference. Just make sure the peanut butter you use doesn’t contain oil, sugar or any other additives. We want to maximize the peanut flavor. Don’t use tomatoes in place of tomato paste. In a lot of recipes, this would totally be acceptable, but in this case, we want to create a thick base for the peanut soup. 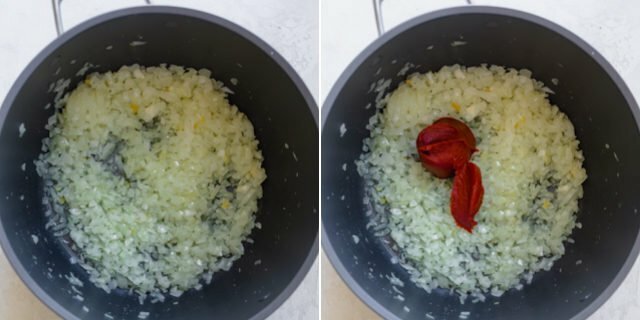 The fresh tomatoes or even canned tomatoes will instead create a lighter broth, which is not part of the authentic recipe. Be careful not to overcook the sweet potatoes. 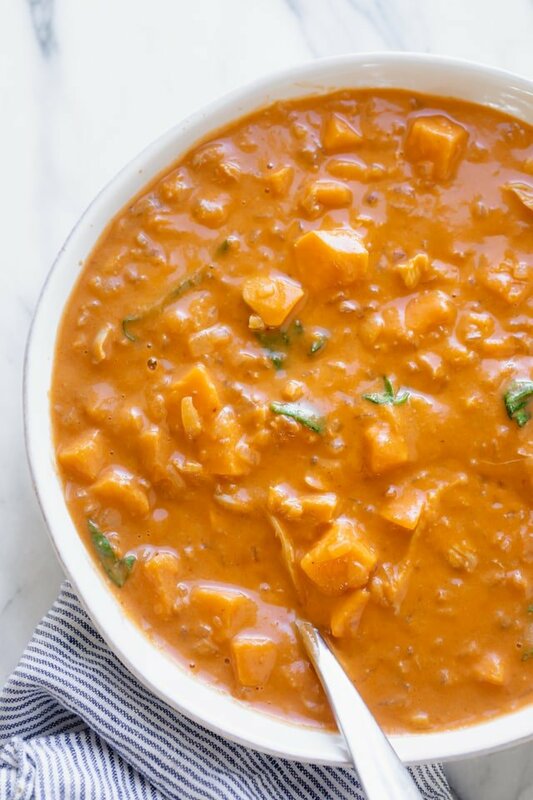 Sweet potatoes add bulk, nutrition and a sweet taste to the recipe. So I love adding them, especially when making it vegan. But if you overcook them, they will become soft and change the consistency of the soup entirely. So make sure to chop them small and check on them after 20 minutes of simmering. This peanut butter soup is a nostalgic recipe for me and reminds me of my childhood. There are a few African dishes that my parents still makes now in the U.S. and this is definitely one of our favorites. What I love about it is that it’s a simple combination of everyday pantry items so anyone can try it and make it without excotic ingredients. Yet the flavor is something very distinctive and delicious. 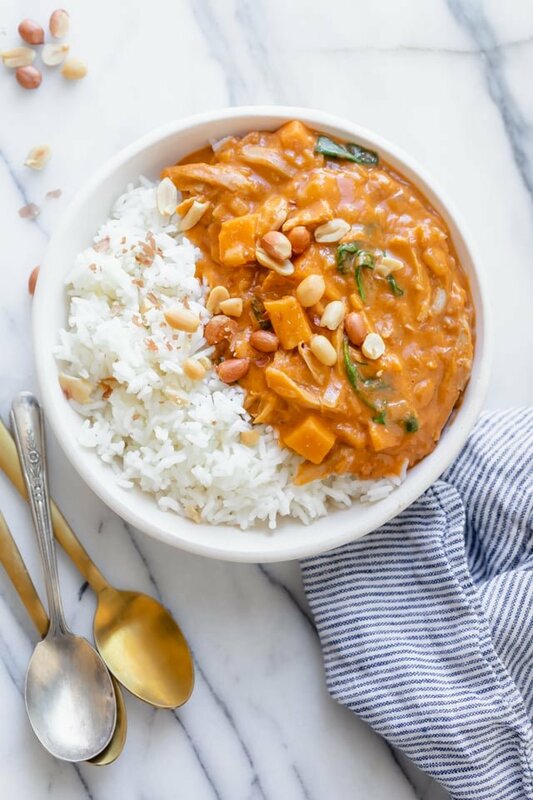 If you’re looking for a different weeknight meal to try out, give this African peanut stew a try. It’s savory, creamy and very flavorful! 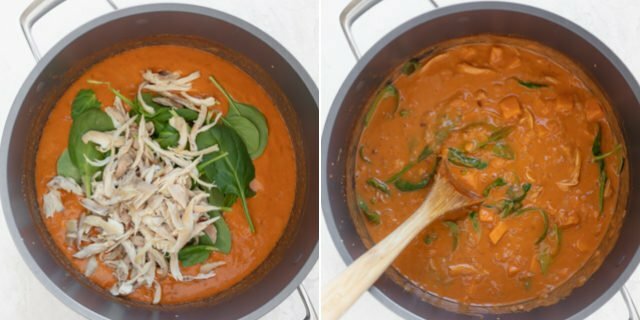 If you’ve tried this healthy-ish feel good West African Peanut Soup recipe or any other recipe on FeelGoodFoodie, then don’t forget to rate the recipe and leave me a comment below! I would love to hear about your experience making it. And if you snapped some shots of it, share it with me on Instagram so I can repost on my stories!
. Heat the oil in a large, heavy pot. Add onions and ginger, and cook for 5-10 minutes until the onions are very soft and translucent, but not browned. Add tomato paste and mix with the onions until they are well coated. Add the sweet potatoes to the pot, season with salt and cayenne pepper, and mix with the onion and tomato paste mixture. Pour the vegetable broth or water into the pot and bring mixture to a boil. Lower the heat to a simmer and cover for 20 minutes, until the sweet potatoes are cooked. Stir in the peanut butter until it’s well blended with the mixture. Add spinach and/or chicken, if desired, and stir to combine. 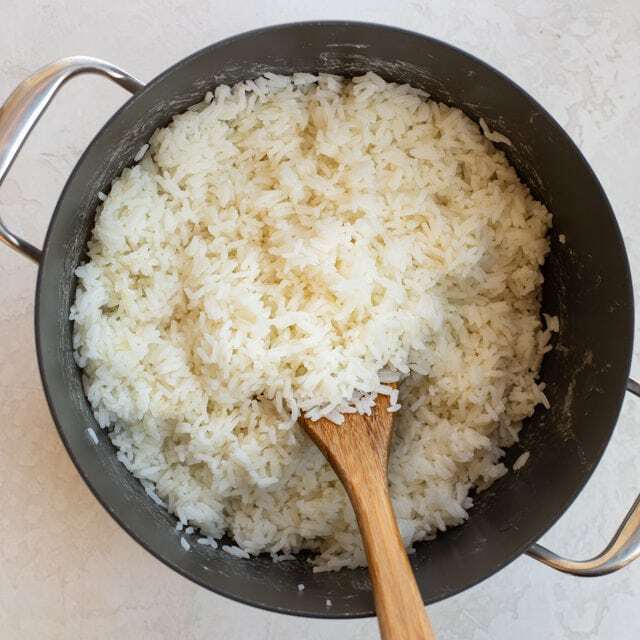 Serve over white rice with crushed peanuts, if desired. Storage: Store any leftovers in an airtight container. It will last about 3-4 days in the fridge. Freezing Instructions: You can also freeze peanut soup in the freezer for up to 3 months by using a sealable container or freezer bag. To re-heat, thaw in the fridge overnight and then microwave when ready to eat. You can substitute the spinach for any other hearty greens like kale, mustard greens or collard greens, or leave them out all together. To make it vegan, just leave the chicken out. You can add tofu, more potatoes or leave as is without the chicken. Nutrition: Please note that the nutrition label provided is an estimate based on an online nutrition calculator. It will vary based on the specific ingredients you use. This information should not be considered a substitute for a professional nutritionist’s advice. The nutrition value is for one serving without the rice or the crushed peanuts on top. Just made it for the first time! I’ve never had anything like it before. I didn’t have sweet potatoes on hand so used russets instead. The flavours were very unique! However I found it a bit bland; and added a bit more salt + some sugar for sweetness! Definitely try it out! So glad you tried it Carol! And I love how you added the salt and sugar for added sweetness! Thanks for being adventurous and trying it! One of my favorite dishes! I love the new ‘tricks’ that Feelgoodfoodie suggests in this recipe. Really allows the peanut butter to turn into a tangy and delicious sauce. 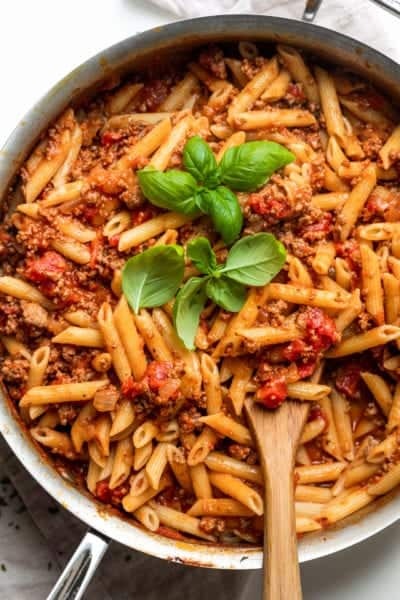 This is such a wholesome and hearty dish. Make sure you share with your friends, especially when you’re looking to discover a whole new cuisine. Thanks so much! I really appreciate your feedback!! This is awesome… and I’m not a peanut butter person, until now. Thanks for the recipe! This is so amazing and rich in flavor! Love African food. Thanks for the recipe. Just made it. Simple, easy to prepare and super delicious, specially with added pepper.